Love the skin you’re in with this innovative skincare treatment. Zupafood™ for SKIN contains a potent blend of superfoods plus an additional 2,000 mg of marine sourced collagen for firmer skin and a reduction in the appearance of wrinkles. Flavored with real blueberries, Zupafood for SKIN is a tasty tonic that not only supports your skin but works to revitalize your overall well-being. What is Zupafood™ for SKIN? Zupafood™ for SKIN is an oral supplement designed to revolutionize your skincare routine. We wanted to create a product that was more than just a collagen boost – a product that works to restore not only the surface of your skin, but all of the internal systems that contribute to a glowing, healthy appearance. With a scientifically formulated blend of New Zealand’s finest superfood extracts, Zupafood™ for SKIN nourishes your skin at a dermis level, while also supporting your body’s complete wellbeing. Our skin is constantly under pressure. Modern lifestyles bombard our skin with pollutants, UV rays and harmful chemicals – not to mention the natural wear that comes from aging. To fortify and restore your skin, you need to take action from the inside out, replenishing your body with specifically targeted nutrients. 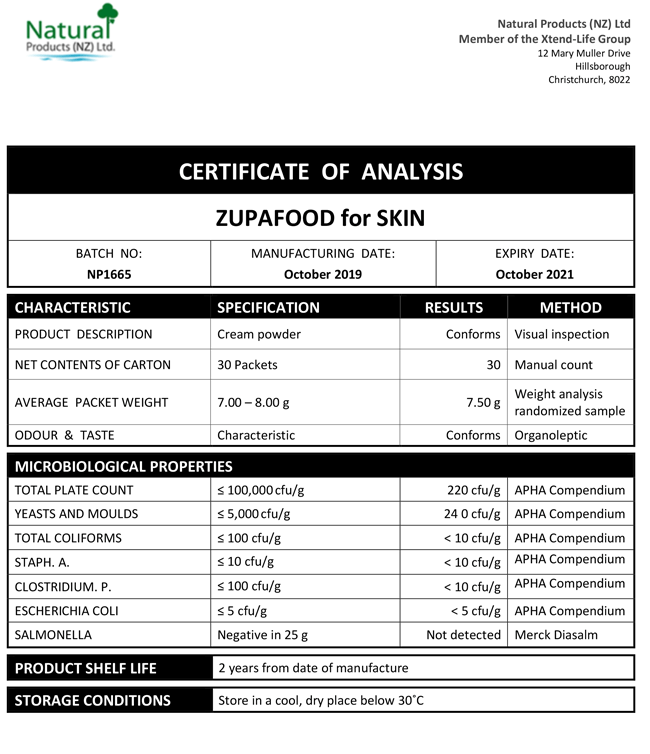 Zupafood™ for SKIN has been carefully crafted to nourish your skin at the deepest level, combining a scientifically tailored mix of the highest quality ingredients into one easy-to-consume packet. Don’t wait until the damage has been done – give your body the fuel it needs to stand up to the elements, so you can face the day brighter, stronger and healthier. How does Zupafood™ for SKIN work? Zupafood™ for SKIN harnesses the power of natural superfood extracts and our own Collactive™ formula to optimize your skin’s natural processes. As we age our natural levels of collagen and elastin start to fall. Zupafood™ for SKIN helps you fight this decline with 2,000 mg of fully digestible collagen and elastin in every serve. Derived from sustainable marine sources, these components help to firm and lift sagging skin, minimize the appearance of wrinkles and support healthier skin and nails. To make Zupafood™ for SKIN even more effective, we have also added a L-Glutathione, Vitamin C and additional red grape skin extract. These ingredients deliver powerful antioxidant properties for long term, age-defying results. The overall health of your body has a huge impact on the appearance of your skin. Zupafood™ for SKIN contains a potent medley of New Zealand super fruits, all harvested locally. This signature Xtend-Life blend includes kiwifruit extract, grape seed extract, grape juice powder, red grape skin extract and apple fiber. Together these ingredients support your whole body to thrive, which in turn does wonders for your skin. Zupafood™ for SKIN helps to raise your calcium levels with a unique form of plant calcium. Produced by red algae it is highly bio-available and won’t build up in your cardiovascular system. We have included 500 mg in every serve, which equates to the calcium benefits of eating an entire cup of raw spinach! Zupafood™ for SKIN superfood powder is sweetened with stevia and flavored with 100% real blueberries – free from all artificial additives or flavorings. Simply mix with water or your favorite beverage and enjoy a refreshing tonic that is as delicious as it is natural. Other ingredients: Flavors (Natural Blueberry, Malic Acid, Citric Acid), Natural Sweetener (Stevia Glycosides), Grape Skin Extract. Warning: If you are pregnant or breastfeeding, please check with your doctor before taking Zupafood for SKIN. We produce our products regularly throughout the year. You can be assured that every packet, from every batch will meet these exceptional standards. Where is the marine calcium used in Zupafood™ For SKIN sourced from? We use Aquamin® TG Marine Calcium which is extracted from red algae (Lithothamnion species). This unique plant is only found in three remote areas around the world. Ours is sourced off the coast of Ireland. During its growth phase, these algae absorb essential minerals directly from the sea, giving Aquamin® TG Marine Calcium its unique and potent multi-mineral content. Although Zupafood is packed with nourishing ingredients, it does not contain the complete array of vitamins and minerals you require from your diet. For this reason, we encourage you to keep using Total Balance or Multi-Xtra at the same time as Zupafood. Is Zupafood™ a better choice than Total Balance to provide the ultimate array of ingredients and support for overall health? How much Iron in is Zupafood™ SKIN? There is a maximum of 2000 ppm of Iron in Aquamin TG which is part of the base blend in all the Zupafood versions, this is equivalent to a maximum of 0.2%. There is also an additional 1 mg of iron per serving of Zupafood for SKIN which is naturally occurring in the other ingredients.